Rockville hasn’t always been the discerning traveler’s first choice for wining and dining, especially with the nation’s capital just 30 minutes away. 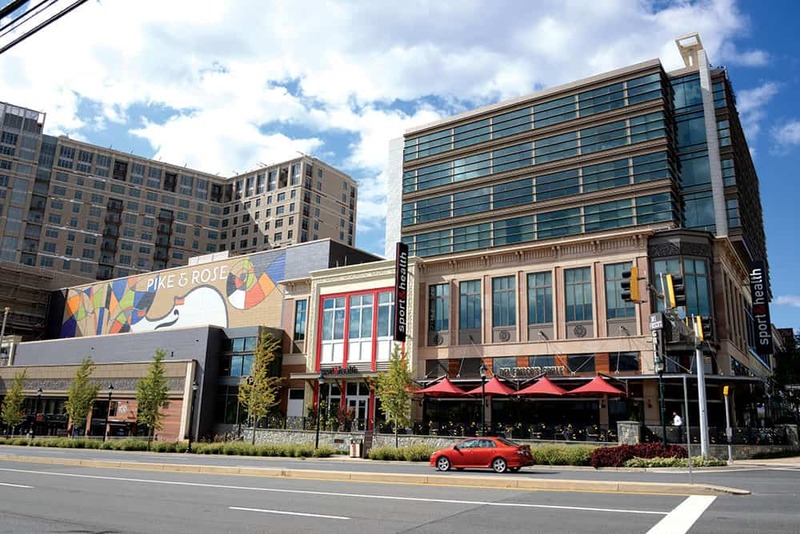 But vibrant and walkable outdoor shopping centers along with restaurants helmed by renowned chefs have made the Montgomery County suburb a destination in its own right. Start with a stroll through downtown’s Rockville Town Square. Locals credit the multimilliondollar entertainment and retail district for reviving the once lackluster city center by making it more walkable and creating a community vibe with sidewalks, benches and a central square, where in warmer weather you can partake of fitness classes and outdoor concerts. On Wednesdays, pick up some local produce and baked goods at the farmers market held at Dawson’s Market, a natural foods store. Dining options include Lebanese Taverna Café, Pandora Seafood House and Bar, and several Asian eateries, including one of the area’s best known Chinese restaurants, Peter Chang, headed by the former Chinese Embassy chef. Grab a pisco sour at La Canela Peruvian Cuisine, notable for its bright yellow exterior and windows covered in wrought iron. 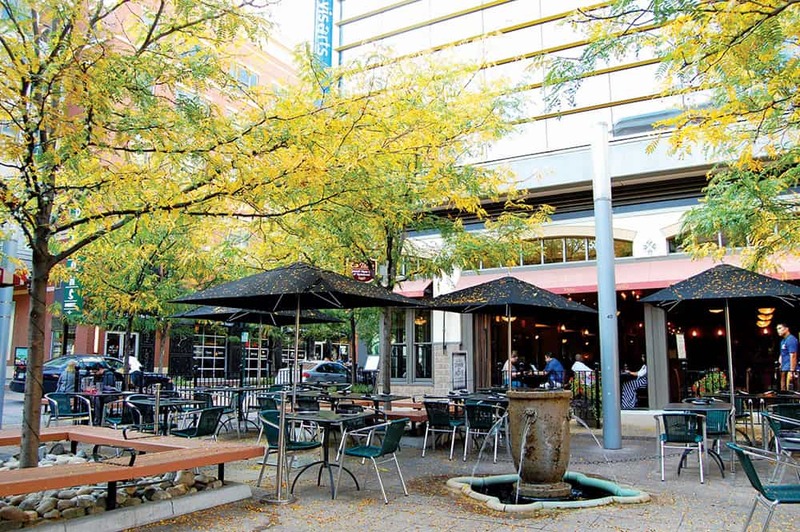 A number of the restaurants offer outdoor dining, adding to the fun—and every Wednesday evening is a happy hour, with food and drink specials. And for more drinking options, a few minutes from downtown is the family owned microbrewery Saints Row Brewing. The Taft Street spot is a great place to unwind with a game of corn hole or pingpong while kicking back a coffee stout. 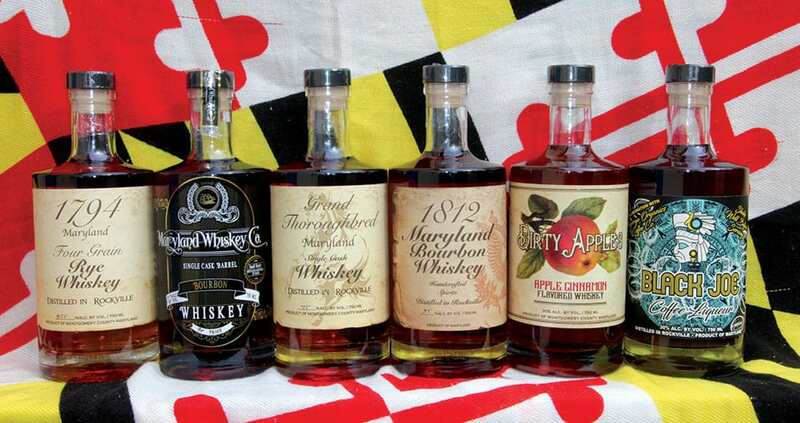 Nearby Twin Valley Distillers sources ingredients from a 50-mile radius to make rum, vodka and whiskey. And nine miles southeast of Rockville Town Square, 7 Locks Brewing offers board games and live music to entertain you as you sip the Devil’s Alley IPA and Snakeden Saison. Several towns just outside of Rockville, including Olney, Gaithersburg and North Bethesda, are worth a detour. Part retail store and part wine and beer bar, Gaithersburg’s Downtown Crown Wine and Beer offers a wide selection of craft beers and specialty wines. Enjoy one of their 22 beers on tap or a wine flight and a plate of charcuterie at an outdoor table. You won’t find rows of vines at Olney Winery, located eight miles northeast of Rockville. Instead, the business, started by a group of friends, sources grapes from all over the world. Olney produces 34 varietals that you can sample and purchase by the bottle in its tasting room. For another taste of the urbansuburban development, head to the swanky Pike & Rose near the intersection of Rockville Pike and Montrose Parkway in North Bethesda. Shop at REI and H&M before some bocce and bowling at Pinstripes or live music at AMP by Strathmore. The complex also hosts festivals, concerts and a weekly farmers market. As of April 1, visitors can stay overnight at Canopy by Hilton, the chain’s newest boutique brand. 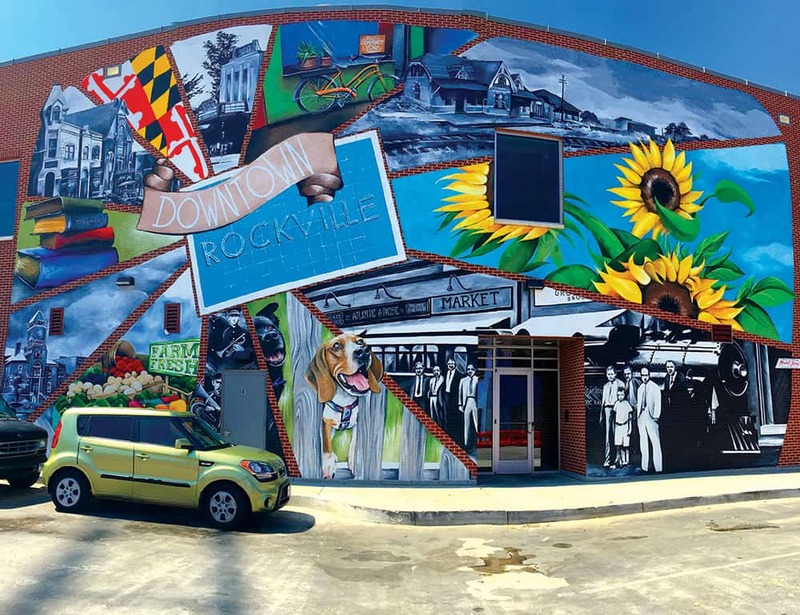 Here’s a rundown of where to eat, drink, shop and stay in Rockville. The brewery offers 10 beers on tap and live music and trivia nights for entertainment. Down an IPA or coffee stout at this dog- and kid-friendly brewery. Embracing the farm to glass movement, this small-batch distillery sources all of its grain and raw materials from businesses and farmers within a 50-mile radius. Head to Olney to sip cabernets and chardonnays at the tasting room of Olney Winery. It sources grapes from seven regions, including Spain, Chile and Italy. The Maryland restaurant group’s contemporary take on Greek cuisine has won raves from diners. Spanakopita, saganaki and spicy lamb sliders are some of the favorites. This outpost of Clyde’s Restaurant Group is worth a stop for its seasonal, locally grown produce as well as its striking décor. It has the look of an upscale Adirondacks lodge, with exposed wood and hunting decor. The seasonal cuisine from three-time James Beard Foundation Awardwinner Chef Sherry Yard sources ingredients from area farms and waters. Afterwards, head downstairs to the luxe iPic Theaters, with plush reclining leather seats where you can order more food and drinks. Future food alert: Asian food hall Pike Kitchen is slated to open this summer at a strip shopping center on Rockville Pike. 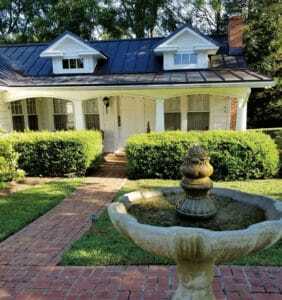 The former home of Harold L. Ickes, U.S. Secretary of the Interior from 1833 to 1846, has been transformed into a historic bed and breakfast. Book the FDR room, named so because Franklin Roosevelt slept there during his visits. Rockville and the surrounding area is home to several boutique hotel brands from national chains. InterContinental Hotel Group’s EVEN Hotel offers spa showers and made-to-order smoothies. Choice Hotel’s Cambria chain is conveniently located in Rockville Town Center, with a bistro and bar and indoor pool. The swanky shopping and dining destination can satisfy foodies, fitness enthusiasts and fashionistas. Sur La Table, REI, Nike Factory Store and H&M are among the stores here. The downtown shopping center is full of eclectic, independent stores. Pick up home furnishings and gifts at Cottage Monet and stuffed animals for your little one at Toy Kingdom. The center offers environmental education programs, short trails and turtles, snakes and other animals to entertain the kids. A 15-minute drive from downtown Rockville, Rock Creek Regional Park includes two lakes and 13 miles of trails. You’ll also find a nature center, playgrounds and pontoon boat tours offered on the Needwood Queen.